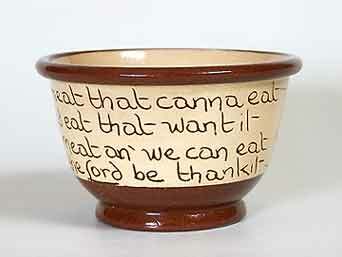 Cumnock Selkirk Grace bowl - 5" (127 mm) diameter, 3" (76 mm) high. An' sae the Lord be thankit"
In 1794 the Countess of Dumfries found clay on her estate and decided a pottery should be started to use it. She instructed her agent, James Taylor, to set one up. He did so, but for the rest of his days was not able to make a success of it. His son took over after his death in 1825, but was no more successful. Various people ran the pottery, many meeting untimely or unexpected ends, until it was sold in 1906 to David Dunsmoor and William Nicol. They ran it until 1920 when their partnership was dissolved and the premises sold to the local gas company. It is known for its motto ware, mainly because this is the easiest to identify - not many pieces were marked.